I am not sure if any of you remember My Farmers’ Market Compulsion and My Overstuffed Freezer (and Belly) post from last summer, but this is along the same lines. I love veggies, I love fresh fruit, and I love to try new foodie things. A few months ago I received a pressure cooker and other canning equipment for wedding gifts. 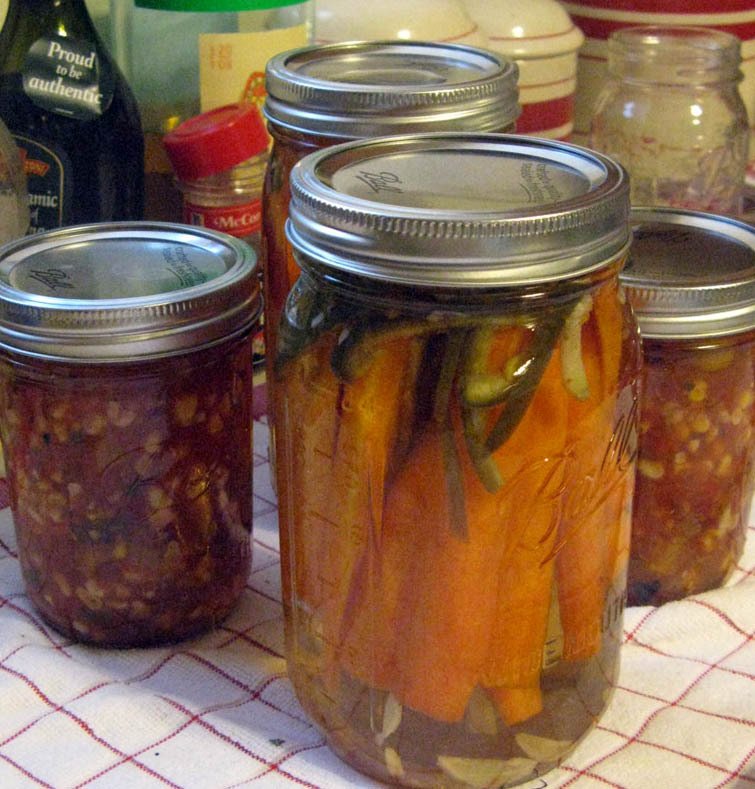 These items have sparked my new obsession — canning and preserving. Two weeks ago Sherri Brooks Vinton's new book Put ’em Up! came out. And because I work for her publisher, a copy of the book was waiting for me in my office mailbox. Since that day the book has been taunting me with its unique recipes and pleading with the food lover in me to make them. I could no longer put the nagging in my head at bay. This past rainy Saturday I started flipping through the pages of Put ’em Up! while drinking my morning coffee. The relentless tugging on my foodie nerves had reached the point where I was forced to set aside all household obligations — I had to forgo scrubbing the tub, vacuuming the carpets, filling out the wedding thank-you cards, and washing the dog. Instead I pulled out the mason jars, the canning pot and equipment, and the food processor and left the overly-needing-to-get-done chores for another day. Moments later I was grabbing my keys and heading out to buy produce. The farmers’ market didn't quite have the abundance of veggies that it does later in the season, so when I finished purchasing a few items there, I headed to Guido's (a local grocer that sells a lot of organic, natural, and local items) for more fresh veggies. Ginger-Carrot Slaw (page 145). This recipe doesn't get canned. The carrots, ginger, bell pepper, and radishes are cooked and stored in a vinegar brine and will keep in a jar or covered bowl in the refrigerator for up to 3 weeks. I served it for dinner as a side with duck breast and wild rice drizzled with a sesame–red wine–shallot reduction. Spicy Carrots (page 148). These are carrot spears. The carrots are kept whole if they are skinny enough and cut in half or thirds if they are thick. The carrots are then trimmed down to be 1" shorter than the jar. They are packed into a jar with jalapeños, red pepper flakes, and garlic, then covered with the vinegar mixture. They are canned per the boiling-water method. I have yet to try these hot little treats, but I am excited to do so. I am a sucker for all things spicy, and so is my dad. He's getting a jar of these as part of his Father's Day gift. on the counter after being pulled from the boiling water. and put on a shelf in a cool dark place. Quick Cabbage Pickle (page 134). 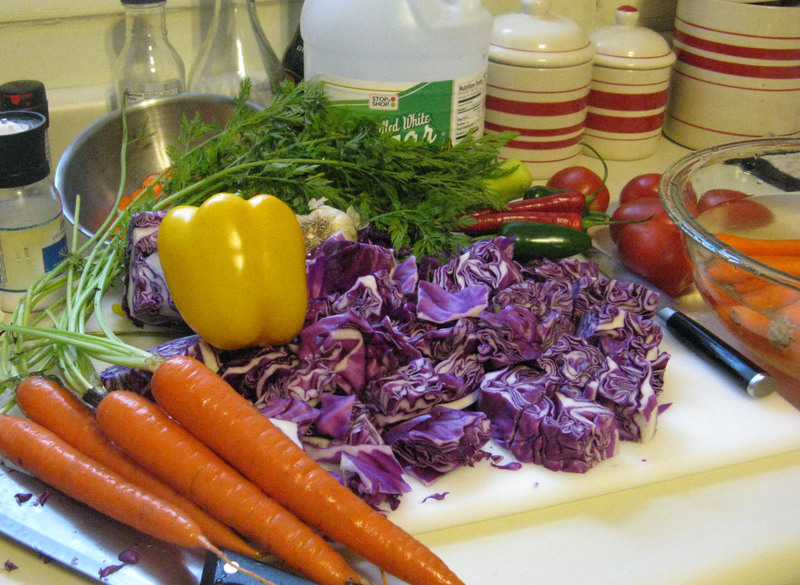 This recipe, like the Ginger-Carrot Slaw, gets refrigerated and not canned. I haven't tried these yet either. Sherri says that her local sushi restaurant serves them before dinner as an amuse-bouche (a french word when literally translated it means "mouth amuser"). 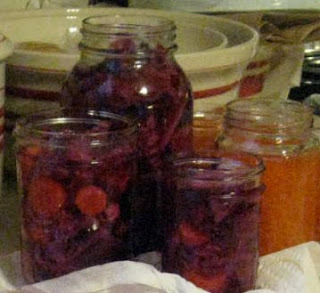 The recipe did not specify which type of cabbage, so I used red cabbage giving the jars a beautiful purple hue. The recipe called for daikon radishes, but I used regular red radishes, which are in abundance here in Western Massachusetts right now. Charred Chili Salsa (page 166). Sherri explains in the techniques section of the book (page 66 to be exact) how to char and roast peppers. I had a rough go charring my mixed chili peppers, and my efforts only yielded about one-third of the peppers. I ended up having to char and use yellow bell peppers to fill in for my ruined chilies. 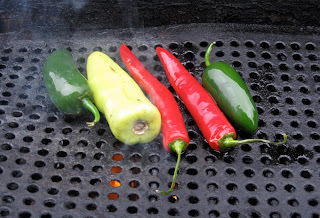 The bigger peppers seem to be easier to char and remove the skin from than the smaller peppers. I definitely need some practice in the charring field. This recipe I canned per the boiling-water method. I had a little bit of salsa that didn't fit into the jars, so I ate it with some nachos and melted cheddar. It was good, but due to my chili-charring mishap, it wasn't as spicy as I would have liked. Chili peppers are on the gas grill getting charred for the salsa recipe. There are so many great recipes in this book. I highly recommend it to anyone who enjoys preparing and eating delicious food! Even if you are new to preserving, this book is for you — in the first two chapters, it gives step-by-step instructions for all the different processes. I will end with a word to the wise: If you are a cook-aholic like me, don't flip through the book if you have other things that need to get done (because it just won't happen)! Everything you made looks delicious! I love to eat and make all kinds of pickles and relishes, too, and only recently sold my canning equipment. I know what you mean about becoming engrossed in a new cookbook - shame you had to forgo all that other stuff, though.